A perennial crop that produces green-purple flowers resembling orchids. The root of this plant is the most desirable part, and is often used for its medicinal properties and in cooking. It has a tan skin, and a flesh that can be any color between pale green/yellow to ivory. It tastes peppery and spicy, and a little sweet. The aroma is strong and pungent. Ginger root's oil is highly volatile, meaning it vaporizes when exposed to air. When using ginger, slice off just what you need from the root. Peel away the brown outer layer and working against the grain, chop, grate or slice the fibrous flesh. To extract ginger juice, the most potent part of the root, wrap grated ginger in cheesecloth and squeeze. Keep the unused portions of the tuber wrapped in plastic or paper towels in the refrigerator; they will keep for up to 2 weeks. Ginger is also recommended to relieve the symptoms of colds. To use, put a piece of fresh ginger in a hot cup of Indian tea (or any tea) and drink. Shelf Life: Fresh, unpeeled ginger keeps up to 3 weeks in the fridge tightly wrapped in plastic or frozen for 6 months. It's not recommended to use dried, ground ginger in place of fresh ginger since the flavors are vastly different. Ginger Root on the other hand, looks like a swelling-rippled root. The skin is shinny with little dry spots. Depending on the plant, Ginger root doesn't come in one size. Choosing: Look for ginger with smooth skin — if it's wrinkled or cracked, it means the ginger is old. It should also be very firm to the touch. Finally, make sure it has a fresh, spicy fragrance. Buying: You can buy Ginger at your local supermarket or spice house. Procuring: A fun way to start a ginger plant is to suspend a two-inch piece of the rhizome over a glass of water. Do this by poking a toothpick on either side of the root. Fill the glass, submerging about one-third of the ginger. When roots grow to about an inch long, plant the rhizome just below the surface of a rich, moist potting mixture in a pot that has good drainage. Plant ginger in a pot for growing indoors or out! Using a rich potting mixture, choose a pot at least four times the size of your ginger rhizome or plant it in the large pot that will be its permanent home on your patio, deck, or other outdoor garden area. Fill the pot three-quarters full of potting mixture; lay your rhizome flat on top and cover it with about an inch of soil. Keep the pot in a sunny location until sprouts appear, then move it to an area with good indirect light. Ginger won’t tolerate bright, direct light. Start a small plant for transplanting into your garden. Plant your ginger root directly into a pot filled with rich potting mixture. Cover the pot with a plastic bag and place it on a sunny windowsill. When the first shoots appear, remove the plastic bag. If all danger of frost is past, move your young ginger plant directly into your garden. Alternatively put the pot in a location where it will get indirect sunlight. Water it regularly, but be sure not to let the soil become saturated. Your ginger plant will grow two to four feet tall. Slender stems and narrow, glossy leaves may reach up to a foot long and resemble the foliage of a lily. Occasionally, your ginger may produce a yellow green flower, but flowers are both rare and unnecessary for the health of the plant. Ginger is not frost hardy so in temperate areas bring plants indoors for the winter and ignore it! Foliage will yellow and die back, but the plant will return to growth in the spring. Harvest ginger after the rhizome has grown three to four months. Since the best time to plant ginger is in the spring, this usually means a fall harvest. Harvested ginger root is usually sun-dried for longer preservation. It can either be stored in a dry cupboard or refrigerated. Mature ginger roots are fibrous and nearly dry. The juice from old ginger roots is extremely potent and is often used as a spice in Indian recipes, and is an quintessential ingredient of Chinese, Japanese and many South Asian cuisines for flavoring dishes such as seafood or goat meat and vegetarian cuisine. Store in the refrigerator. If you'll be using your fresh ginger root in the near future, wrap the ginger in a towel and place it in a sealed plastic bag. Put the bag in the refrigerator. The root should stay fresh for up to three weeks. Freeze your ginger root. Use a similar method for freezing ginger root (wrap in a towel and place in a plastic bag). The root will last up to three months in the freezer. Dry the ginger root. Dried ginger root is commonly used in baking, including in ginger cookies. To dry ginger, grate the root and allow it to dry on a cookie sheet in a cool, dry place for three to four days. When completely dry, place in clean jars or plastic bags. The root will keep for up to one year. Pickle it. Pickled ginger root is a delicacy in many Asian cuisines. To pickle the root, place it in a sterile bottle of vinegar or sherry and allow to sit in the liquid inside the refrigerator for two to three weeks. The ginger will keep up to a year in the refrigerator. Queen Elizabeth I of England is credited with the invention of the gingerbread man, which became a popular Christmas treat. Ginger (botanical name Zingiber officinale) is in the same family as turmeric and cardamom. It is native to Southern Asia and has long been a staple addition to Asian cuisines. Ginger is quite popular in the Caribbean Islands, where it grows wild in lush tropical settings. Jamaican ginger is prized for its strong, perky flavor, and this island currently provides most of the world's supply, followed by India, Africa and China. 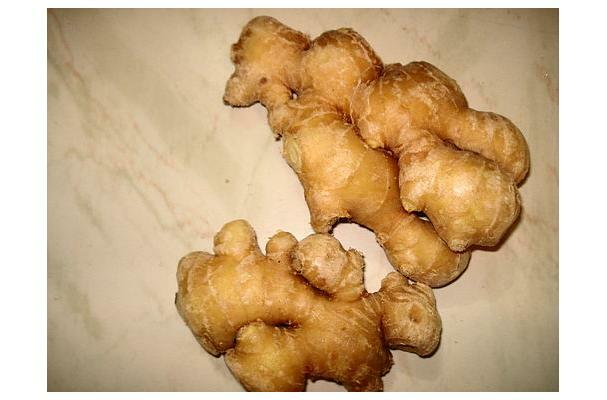 The gnarled, bumpy root of the ginger plant is the source of this wonderful spice. Although it is easily grown in tropical regions of the south, you will rarely be treated with blooms during cultivation at home the way it does normally in the wild. It can easily be grown in a flowerpot at home, but be sure to bring it indoors when the weather turns cool. History: Ginger's current name comes from the Middle English gingivere, but ginger dates back over 3,000 years to the Sanskrit srngaveram meaning "horn root" with reference to its appearance. In Greek it was ziggiberis, and in Latin, zinziberi. Although it was well-known to the ancient Romans, ginger nearly disappeared in Europe after the fall of the Roman Empire. Thanks to Marco Polo's trip to the Far East, ginger came back into favor in Europe, becoming not only a much-coveted spice, but also a very expensive one.